You will notice that it is much harder to keep your teeth clean with braces. 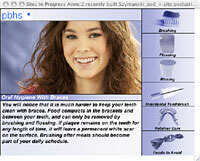 Food compacts in the brackets and between your teeth, and can only be removed by brushing and flossing. If plaque remains on the teeth for any length of time, it will leave a permanent white scar on the surface. Brushing after meals should become part of your daily schedule. Use a soft toothbrush with firm pressure and brush at a 45-degree angle to the tooth; brush in small circles above and below the brackets. Click here for visual instructions. Your toothbrush will wear out faster because of your appliances, so be sure to replace it whenever the bristles start to fray. A Waterpik can be a useful addition but it cannot remove the sticky plaque that adheres to the teeth. Electric toothbrushes are great. Flossing is important and should be done every day. The floss threaders are reusable. The dentist will determine how long you need to wear your retainer. Time varies with each patient. Some people may need retainers for an extended period of time in order to eliminate shifting of the teeth. In some cases, permanent retention may be necessary. The retention period is an important part of your overall treatment and should not be neglected! The removable appliance is carefully designed to move or to hold your teeth. It is important that it is worn according to instructions and brought to each appointment. Wear your appliance at all times, even while you are asleep. It may be removed while eating, swimming, or playing vigorous sports activities. In two or three days your speech will return to normal with the appliance in place. Avoid flipping your appliance with your tongue. This can cause damage to your teeth or breakage of your appliance. Your new appliance may make your teeth sore for a day or two, especially after an adjustment. If you have a sore spot on your gums call our office so that we can adjust the appliance. Keep your appliance away from dogs or cats as they love to chew on them. Avoid storing them near any source of heat. An additional charge may incurred for lost or broken appliances.